Your password reset link is on its way. If you have problems accessing your account, please contact us at 888-757-4774 and we'll help you out. I'm sorry, your email address was not found in our system. If you think this is a mistake, please contact Customer Service at 888-757-4774 or email us. number of stages, user interface, mount, voltage, changeover type and ability to work with sensors. non-programmable mode if you choose not to set a program. •* Note: If you have a heat pump, electric heat or millivolt system, it is important to select a thermostat that is • •compatible with this specific type of system. This refers to the number of heating or cooling sources that may be controlled by a single thermostat. For example, if a system contains baseboard heat, a hot air system and air conditioning, then there are two heating stages and one cooling stage. In this example, a 2 heat/1 cool thermostat should be installed. Note: If you have auxiliary heat (backup heat, such as a fan coil or baseboard), that counts as a second heating source. The number of stages may be written in several different ways. The most common are 2H/1C or 2 Heat/2 Cool; both mean that there are two heat sources and one cool source. 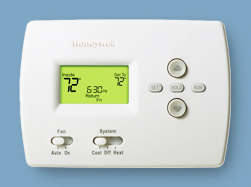 The number of stages can vary from single heat or single cool up to 4 Heat/3 Cool on a single thermostat. 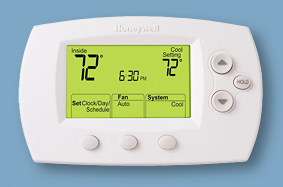 Thermostats are operated using a digital touchscreen, buttons with a digital screen, or simple mechanical dial. 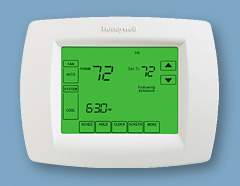 Our most popular touchscreen thermostat is the Honeywell TH8110U1003. 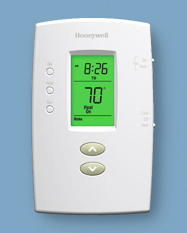 Thermostats may be mounted horizontally or vertically depending on personal preference and space constraints. 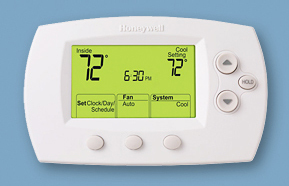 Some digital thermostats have a large display, which makes it even easier to read. Thermostats run on either line voltage or low voltage.The easiest way to tell which type you need is by looking at the wire. If it is a very thin wire (like a doorbell or a speaker wire), you will need a low voltage thermostat. If it is a heavy wire, you will need a line voltage thermostat. 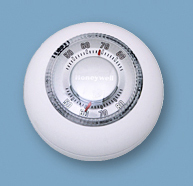 Thermostats either have automatic changeover or manual changeover. 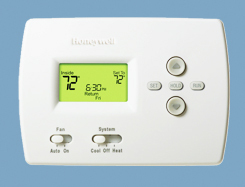 Thermostats with auto changeover switch from heat to cool automatically depending on the indoor temperature, while thermostats with manual changeover will remain on either heat or cool until you change it. At SupplyHouse.com, our goal is to bring you the highest quality plumbing, heating and HVAC supplies at competitive prices. Our product catalog includes PEX Plumbing Supplies, Radiant Heat Supplies, VisionPro Honeywell Thermostats, Taco pumps and mini-split air conditioners. If there are items you are looking for but can't find on our website, please contact our Customer Service Representatives & we will do our best to find what you need.